Chrissie Wellington...dominando el Ironman femenino. 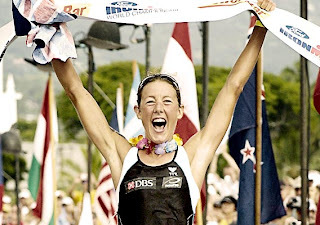 Tengo que reconocer que soy un gran fanatico de Chrissie Wellington, dos veces campeona del Ironman de Kona Hawaii. Ella ha demostrado que no tienes que tener la bici mas cara, el mejor casco, los mejores rines etc ect , lo que tienes que tener, y que no se puede comprar, es las ganas de mejorar y hacer los trabajos duros en entrenamiento. Hoy leyendo en internet encontre el blog de Chrissie Wellington, pueden verlo aqui. En su pagina personal encontre el reportaje que ella escribió del Ironman de Kona 2008. Para los que no saben ella ganó el 2007 y en el 2008 tuvo un flat en la bicicleta que casi la saca de carrera, perdio la primera posicion al retrasarse mas de 8 minutos ya que no pudo inflar la llanta. Otra competidora le dio la herramienta necesaria para inflar la llanta (un c02), nadie te puede ayudar en un ironman excpeto otro competidor, demostrando la escencia del tipo de competitividad que hay en este deporte. Aqui les pongo un extracto de lo que escribió Chrissie, para ver el articulo completo pueden ir a su pagina aqui. So having had a week to recover I am finally able to put fingers to keyboard….although the hangover might mean that I am slightly less coherent than usual! I am living by the motto – work hard and play hard!!! Ok, so the race…..wow….where do I start?! I went into this race feeling strong, but I certainly wasn’t taking anything for granted. The huge amount of amazing, record breaking performances at races this year have shown just how deep and strong the women’s ironman field is. And also, in Hawaii anything can happen. As i found out! I wasn’t that nervous before the start, and was just really excited about racing. Last years swim was more like a complete drown, and I think I spent more time looking at the fish than I did concentrating on going forwards. So this year, there was less deep sea diving and more arm and leg action. Normally the swim start is a bit like a Friday night pub brawl, but aside from a few token punches this one was pretty sedate, and I found myself in a good position and felt good. I don’t know if I had ‘sting me’ written all over my body though, but it seemed like every jellyfish in the pacific ocean had made a bee-line for my body, and despite wearing an all over swim skin I still managed to get stung about ten times. The little buggers. Anyway, I came out of the water in 56 minutes, and jumped aboard the P2. Normally it takes me about 40km to get into my rhythm on the bike but for some reason I seemed to have beans right from the start, and found myself in the lead at around the 30km mark. Everything was going rather well, until about 80km when I found myself bumping around a bit more than normal. Rather than continuing to enjoy the rumble strip vibrations I decided to stop and look down. Yes, rim had hit tarmac. I had a flat. Quite a few thoughts went through my head. Oh dear was one of them. Bugger was another, and the rest shouldn’t be repeated in public. As all the tri geeks know, I ride clinchers. So I whipped the tyre off and took the inner tube out, checked for any offending sharp particles, put in a new tube and on went the tyre. I was quite impressed with the speed of my rubber changeover…. that was until I tried to use the two CO2 cartridges. Unfortunately I didn’t remember to press down hard on the tyre, so the air went everywhere except for into the valve. Bugger i thought again. What happened next deserves a very special mention. Long story short, one of my competitors, the 2006 Australian IM Champion Bek Keat, gave me her CO2 cartridge. This encapsulates everything that is truly great about Ironman. Without her help I would probably still be walking back from Hawi. I am truly grateful to Bek for this amazing demonstration of sportsmanship. Bek, if you are reading this. The beers are on me. And then some. People have asked me how I managed to stay so calm with the time ticking away and everyone whizzing past. To me this is what racing is. It is about taking the rough with the smooth. The highs and the deep lows. I always try to remain positive, and to meet every fear or challenge with a smile. It also adds some spice to the race and i understand that Ironmanlive and NBC got some great coverage of me going to the toilet in the bushes – which I am sure has made great family viewing! But all joking aside. I am not a quitter. I would have stood there for an hour or more if it meant I could get back on my bike and complete the race. As the old saying goes, it ain’t over til its over. Never give up. Ever. Anyway, back on my bike I started hammering away. I climbed the rest of the way to Hawi, and then came the long descent. As most people know, I am normally a grandma when it comes to descending. But on that day it felt like I had a firework up my posterior. I didn’t care about the side winds that were blowing at what seemed like 100miles an hour, I didn’t care about the rumble strips, or the downhill gradient. I just held on for dear life, and my little legs have never spun round so fast! I managed to catch the lead girls in about the same place as last year, at the Kawaihai intersection. And from then on I didn’t look back. The winds were in our faces, gusting from the side and, thankfully, up our backsides in the last stretch home. I came into T2 feeling good, deafened by the noise of the crowds but not knowing how my legs would be, having worked hard to make up for lost flat tyre time/CO2 incompetence. I swear someone added a few extra miles along the Queen K, as the drag to the energy – or no energy – lab seemed to go on forever. I guess the key for me is to stay positive, to have faith in myself and my training and most of all to smile. So that’s what I did. ... As I said before….never ever give up. Paso navidad y tengo ganas de entrenar!! El 26 de diciembre hicimos el que seguro sera una montada tradicional la cual denominamos "el paseo de la moña" dedicado en mi caso a la varias roscas de mona con mantequilla o mejor dicho mantequilla con moña que me comi en navidad. Pero al menos sumamos los 115 kms con un bien promedio de velocidad y de pulsaciones acompañado de Gae y Matias que pasaba la navidad aqui en Panama. Tambien estuvieron presentes Ramon M y Ernie D.
El 27 fue un sabado espectacular. Salimos una docena de TTT a hacer una rodada larga con un buen promedio y se formó una repartidera de rejo en los 119 kms de recorrido a 31.4 kms de promedio. A entrenar de ha dicho. Para los que le gustan los numeros aqui hay un detalle de los clasificados para el Ironman de Kona Hawaii en el Ironman De Brazil 2008. Segun me han comentado el año pasado fue un Ironman dificil en Floripa, bueno mas dificil que lo normal. La natacion hubo mucha corriente lo que hizo que la natacino se volviera mucho mas larga situacion que estoy seguro sacó de ritmo a muchos. Este Ironman es un carrera en donde el trote es muy rapido ya que solo hay una loma en ka maraton y despues es plano por lo que hay que tener la fuerza suficiente para poder bajar las 3:30 si se quiere tener la posibilidad de obtener el preciado tiquete a Kona! Ya estamos en vivo con la pagina www.caminoakona.com. Ahora podrán acceder a nuestra pagina con el dominio directo caminoakona.com. Dentro de la Pagina estaremos dándole espacios a otros atletas de habla hispana que deseen compartir sus historias sobre su trayectoria a Kona, ya sea para este año o para cuando se lo propongan. Ya todos sabemos que ir a Kona no es algo que se logra en poco tiempo, es una decisión que se debe tomar con mucha cautela, pues el tiempo, dedicacino, sacrificio y compromiso que hay que tener es enorme. Durante el trayecto habrán altas y bajas, por lo que la familia y los compañeros de entrenamiento y el coach son muy importantes para no descarrilarse y mantener firme el objetivo de escuchar la partida dentro del Oceano Pacifio en la Isla de Kona, Hawaii. Con el Duatlon de Albrook finalizó la temporada 2008, y también el Ranking Nacional de la UTP. Yo no se, pero yo nunca he visto un ranking tan cerrado como el de este año. El Duatlon de Albrook fue ganado en un sprint fenomenal de Billy Gordon y Gabriel Gonzalez con un tiempo record de 1:23:06 y 1:23:11, casi 3 minutos mas rápido que el año pasado, el triatlon/duatlon esta mejorando en Panamá. Es verdad que el ranking no premia tal vez al mejor atleta, pero si premia al atleta mas consistente que compite en las carreras locales, por eso su valoración debe ser conforme a lo que premia el ranking, constancia. El año pasado logre el objetivo que era repetir la primera posición en la Categoría 30-39, sin embargo este año quería quedar en el podio del Ranking General y lo logre, quede de 3ero a tan solo 0.59 puntos del atleta chiricano y excampeon de Portobello, Richard Gonzalez. Hoy en la duatlon richard logro 82.21 puntos y yo logre 80.36 para un acumulado de 517.45 vs mis 516.86! A pesar de que quería quedar de segundo estoy contento porque logre el objetivo de quedar en el podio y se que le di con todo en todas las competencias. Aunque recordando este año, esos 0.59 puntos pudieron haber sido evitados si: no me quedaba flat en Portobello, Luismi no me chocaba en la bici en Coronado, jajajaja, pero todo esto es motivación para le próximo año! Solo falta ya dar las gracias a toda la UTP y sus directivos al igual que a los voluntarios que hacen todo esto posible, al igual que a mis compañeros del TTT que hacen de la practica de este deporte algo muy especial. 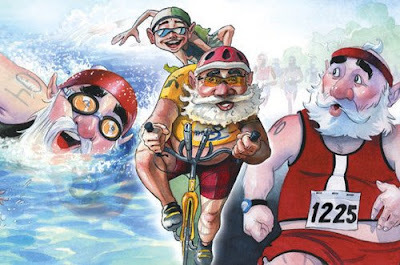 Este año tendrá la ultima competencia de la Union de Triatlon de Panamá el proximo domingo 14 de diciembre se llevara a cabo en las riberas del Canal de Panama, con el ya conocido Duatlon de Albrook, aqui se definiran los primeros tres del Ranaking Nacinoal para el 2008. En primer lugar esta Gabriel Gonzalez, de segundo - yo - y de tercero el juvenil y tambien TTT Gil Brown con tan solo un punto de difierencia con el segundo lugar. Durante los ultimos dos años he quedado de primero en la categora 30-39, pero como objetivo del año 2008 me propuse quedar en el podio general y parece que es posible lograrlo si tengo una buena carrera este domingo en el duatlon. Gil, por su parte me ganó el año pasado, con una corrida de los primeros 6kms de 21 minutos y yo 23 y algo la diferencia se torno mucho para el ciclismo donde no lo pude agarrar. Si eso pasa este año, estoy listo para la foto. Pero confio mucho mas en mi corrida este año, voy a salir a darlo todo en la primera corrida y tratar de mantenerme cerca del peloton de punteros en la bici y que todo se defina en la ultima corrida de 3k. Para la corrida hoy me hize la prueba ya conocida por el TTT y vuelta rapido al Parque Omar despues de una suave, tiempo record hoy... 14:50 - incluyendo el parque, para los que saben es de fruteria a fruteria!!! Este rankig lo hize yo, no es oficial y no cuenta con el aval de la UTP, si cree que hay algun error refierase a la UTP. El Ironman Brazil se lleva a cabo el ultimo domingo del mes de mayo, en la Isla de Florianopolis en Brazil, por ser el unico en Sur America reune a los mejores atletas del cono sur en su busqueda de la presiada plaza para participar en el campeonato del Mundo de Hawaii. 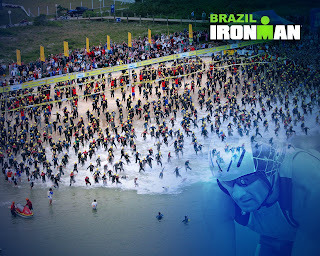 Brazil ha sido a la fecha mi primer y unico Ironman. Lo hize en el 2007 y logre un tiempo de 10:48, no esta mal para ser el primero, pero si esta muy lejos del tiempo necesario para obtener una clasificacion a hawaii. Por eso siento que es indispensable que lo haga nuevamente este año para preparame para Ironman Louisville donde creo que tengo mayor oportunidad de clasificar para Hawaii, aunque en los dos esta dificil, pero no imposible. El 2007 fue un año de muchas complicaciones laborales, lo que hiceron que me separara del entrenamiento por unos meses, y eso uno lo paga. Llegue al ironman de brazil, no solo con mucho miedo, sino como varias libras de mas y mucho menos entrenamiento del que necesitaba, de esto me di cuenta en media carrera!! Aqui tengo unas fotos del viaje al Ironman Brazil en el 2007. En fin estoy con muchas ganas de regresar a Floripa y disfrutar de esta carrera y ver a todos los amigos!! Nos vemos en floripa.